According to the National Park Service, over 3 million men (and a few women!) fought in the U.S. Civil War, which was about 10% of the population during that time. Most of them – at least 48% of Union men and 69% of Confederate men – were farmers prior to the war. And, for most of these men, going off to fight was the first time they had left their homes. It’s fascinating, then, to see how they lived as soldiers, both on and off the battlefield. These men developed a camaraderie that lasted long after the war, which had lasting implications to the U.S. as a whole (for example, baseball developed into a national game because it was played, on both sides, during soldiers’ leisure time). Learn more about these men and their heroism by picking up one of these books about the soldiers life during the war (and don’t forget, we have the Civil War 150 exhibition running until April 13!). Against this tragic backdrop, the author highlights both the lives of everyday Indian foot soldiers as well as the military exploits of such great Indian commanders as Confederate General Stand Watie. Facing both battlefield fire and the fire of hatred and deeply held racial attitudes, about 180,000 men of African descent fought as part of the Union Army, to help save the Union and end legal slavery in the United States and-they hoped-for their own liberty and dignity. First-hand accounts that include diary entries and personal letters describe the experiences of boys, sixteen years old or younger, who fought in the Civil War. Extended biographical sketches of twenty of the most significant, compelling, and colorful of the Southern generals. Leavened with 10-15 relevant photographs and illuminating anecdotes, each profile also includes descriptions of the most important military actions in which each general was involved. Through diaries and letter written on the battlefield, in camps, and on the deathbeds of soldiers from north and south, Wiley Sword, writes about more than the Civil War. He writes of the complex working of a soldier’s mind& coming to grips with life and death in a time when his country was at war with itself. McPherson shows that, contrary to what many scholars believe, the soldiers of the Civil War remained powerfully convinced of the ideals for which they fought throughout the conflict. Motivated by duty and honor, and often by religious faith, these men wrote frequently of their firm belief in the cause for which they fought: the principles of liberty, freedom, justice, and patriotism. In this compelling book, Anita Silvey explores the fascinating secret world of women soldiers: who they were, why they went to war, how they managed their masquerade. 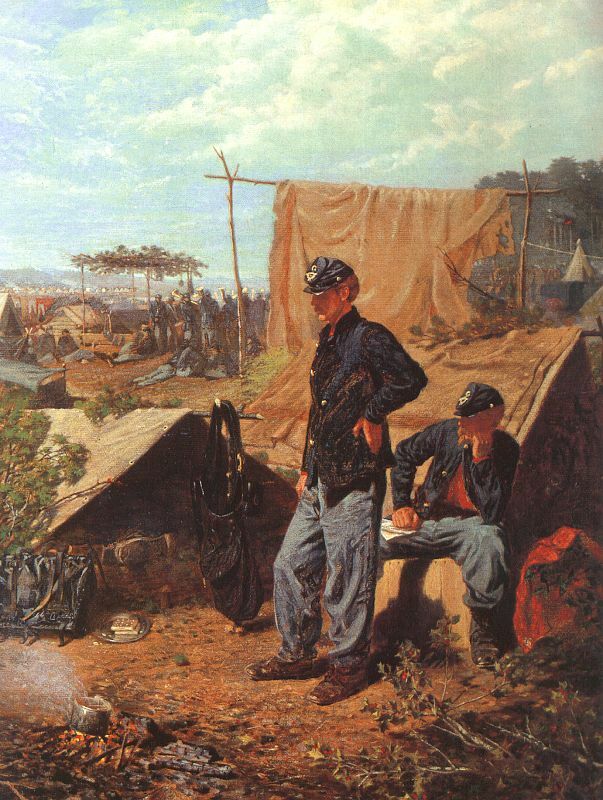 Describes the daily life of the Union soldier; camp life and food, medical treatments, and what fighting was like. Of the millions of Americans who have gone into combat in the past century, fewer than 1,300 have earned the Medal of Honor, and many of those were awarded it for actions they did not survive. Their courageous and selfless feats in battle are barely conceivable. They plunged into heavy fire, ventured boldly behind enemy lines, and threw themselves on live grenades. But who are these people? This book shows how average Americans coped with despair as well as hope during this vast upheaval. It brings to life the full humanity of the war’s participants, from women behind their plows to their husbands in army camps; from refugees from slavery to their former masters; from Mayflower descendants to freshly recruited Irish sailors. Drawing from the more than 10,000 documents housed in the privately held Gilder Lehrman Collection, Robert E. Bonner has movingly reconstructed the experiences of sixteen Civil War soldiers, using their own accounts to knit together a ground-level view of the entire conflict. Many accounts of the Civil War battles, armies, and key figures have been written over the years, but none have looked at the bloodiest war in our nation’s history through the eyes of the cavalry. The horse soldiers in the Civil War are often referred to as the last of the cavaliers, men who valued their honor as much as their cause. Describes the agony and horrific nature of the Civil War from the perspective of the soldiers who fought in it. Draws upon the letters, diaries, and memoirs of Northern soldiers to reveal their deepest fears and traumas, and their sources of inner strength. By identifying recurrent themes found in those accounts, Hess (history, U. of Tennessee), constructs a multilayered view of the ways in which these men coped with the challenges of battle. Using soldiers’ letters, diaries, and regimental newspapers, Chandra Manning allows us to accompany soldiers–black and white, northern and southern–into camps and hospitals and on marches and battlefields to better understand their thoughts about what they were doing and why. Annotations courtesy of the TFPL catalog, unless noted otherwise. Though the Civil War was fought 150 years ago, we encounter its legacy daily. Author and Civil War re-enactor Sherri George will demonstrate the war’s influence on life in the 21st century, from food to clothing to money. She’ll also display the uniforms, accoutrements, and weapons of the Civil War soldier and talk about the soldiers’ daily lives, including those in Idaho Territory in the 1860s. Sherri George has been a Civil War re-enactor since the 1990s, and has been a member of the Idaho Civil War Volunteers, the Washington Civil War Association, the Utah Civil War Association, and the Society of Civil War Surgeons. Her writing has been published in Idaho Magazine, the anthology “Hauntings from the Snake River Plain”, and various special interest magazines and newsletters. She is currently editing her Civil War novel for publication. Gary Eller will demonstrate historically-based Idaho songs and discuss their historical underpinnings. Through these songs, he will share anecdotes about interesting Idaho individuals, places and events. Eller also will discuss the techniques used to collect, preserve and interpret songs based on Idaho’s heritage. The songs range from somber event ballads to hilarious parodies based on local life at the time the songs were written. Gary Eller has played American roots music since he grew up in rural West Virginia. Following a thirty year career as a nuclear scientist at Los Alamos National Laboratory in New Mexico, he retired to Nampa and immediately became deeply involved in Idaho history and music. With funding from the Idaho Humanities Council in 2007 and 2008, he compiled almost 200 historically rooted songs of our region and performs them at many events throughout Idaho. Eller works closely with regional museums and universities to collect, archive, and bring to life through performance and interpretation the wonderful windows into Idaho’s heritage that these songs provide. David Leroy will be here to explore the unique relationship between the sixteenth President and Idaho Territory, which he created in 1863, appointed friends to govern, mentioned in two State of the Union speeches, and even considered on the afternoon he was assassinated. Mr. Leroy defends the claim that more than Kentucky, Indiana, or Illinois, Idaho is the state most related to Lincoln! David Leroy is chairman of the Idaho Abraham Lincoln Bicentennial Commission and Chairman of the Governor’s Council of the United States Lincoln Bicentennial Commission. A former prosecutor, Attorney General, and Lt. Governor, Dave has been lecturing on Lincoln since 1976. He is the author of many articles and a book on the sixteenth president, and has a collection of historic artifacts relating to Lincoln’s life which he uses to enhance his talks. His interpretations and comments tell of the unknown, the unusual and the “real animal” as Lincoln called himself. Mr. Leroy’s appearance is sponsored by the Idaho Humanities Council. This gripping Civil War novel is told from the point of view of Adair, a young Missouri woman who is falsely accused of being a Confederate spy. Whether she faces a long trek to find her family, a stint in prison, or an attraction to her interrogator, Adair’s life as a woman trying to survive the war years will capture the imagination of readers. Civil War 150 is a national traveling panel exhibition organized by the in partnership with The Library of America. The project, “Civil War 150: Exploring the War and Its Meaning through the Words of Those Who Lived It”, has been made possible in part through a major grant from the National Endowment for the Humanities: Exploring the human endeavor. One of the items patrons request most at the Reference Desk is a test prep guide. Of course, in the Library we have several study guides for things like the ACT, SAT, GRE, and GED, but there are some areas in which finding good, updated guides can be difficult. This is when a Great Online Resource such as LearningExpress Library comes in handy. LearningExpress Library offers practice tests, e-book guides, and tutorials in a wide range of subjects. They’ve got all the college-prep guides, but they also have study helps for things like the EMT license, cosmetology, CDL, electrical and plumbing licenses, real estate, teaching, nursing, and dozens more. Most of the tests offer feedback, which can help when you’re struggling with a topic. Plus, they offer courses to help participants increase their skills in things like math, reading, and computer technologies – or even personal finance! Plus, they have resources for Spanish-speakers. All of these resources are accessible and doable online – which means you can prep for the GMAT or the LSAT in your PJs. For Idaho residents, go to lili.org and click on LearningExpress on the right. March is Women’s History Month! In celebration, we’re highlighting the specific experiences of some American female pioneers. The accomplishments of the women listed below came about because of their perseverance, their belief in themselves, and most likely, because they enjoyed what they were doing (which is something all of us can learn from!). Read one of the biographies and get inspired. A critical biography of one of America’s greatest writers describes Wharton’s adventure-filled travels in Europe, the literary and artistic circles in which she lived and worked, her heroism during World War I, and the evolution of her writing. In 1926, a plucky American teenager named Trudy Ederle captured the imagination of the world when she became the first woman to swim the English Channel. Stout offers the dramatic and inspiring story of Ederle’s pursuit of a goal no one believed possible, and the price she paid. Uses interviews with hundreds of legal and political insiders and information from formerly-private papers of the justices, chronicles the life and career of the first female justice on the United States Supreme Court. Traces the life of Aretha Franklin from deserted child, to teenage mother, to Grammy winner, to inductee in the Rock & Roll Hall of Fame. A portrait of the first female self-made millionaire describes her birth in 1867 to former slaves, the creation of her cosmetics empire, and her work as a philanthropist and women’s rights champion. Robin Gerber focuses on the heart of Graham’s success: her leadership. Gerber shows how Graham overcame an emotionally impoverished childhood, deep insecurities, and a marriage to a brilliant but mentally ill husband. Drawing on exclusive interviews with some of her closest friends and colleagues, such as Ben Bradlee, Sally Quinn, Margaret Carlson, and Gloria Steinem, Gerber analyzes the principles that guided Graham’s toughest decisions. Annotations are courtesy of NoveList Plus, unless otherwise noted. Login to Novelist Plus using your TFPL Library card.